What is Tax Freedom Day? Tax Freedom Day is the day when the nation as a whole has earned enough money to pay its total tax bill for the year. A vivid, calendar based illustration of the cost of government, Tax Freedom Day divides all federal, state, and local taxes by the nation’s income. In 2013, Americans will pay $2.76 trillion in federal taxes and $1.45 trillion in state taxes, for a total tax bill of $4.22 trillion, or 29.4 percent of income. April 18 is 29.4 percent, or 108 days, into the year. Why is Tax Freedom Day later this year? Tax Freedom Day is five days later than last year, due mainly to the fiscal cliff deal that raised federal taxes on individual income and payroll. Additionally, the Affordable Care Act’s investment tax and excise tax went into effect. Finally, despite these tax increases, the economy is expected to continue its slow recovery, boosting profits, incomes, and tax revenues. When is Tax Freedom Day if you include federal borrowing? Since 2002, federal expenses have exceeded federal revenues, with the budget deficit exceeding $1 trillion annually from 2009 to 2012. In 2013, the deficit will come down slightly to $833 billion. If we include this annual federal borrowing, which represents future taxes owed, Tax Freedom Day would occur on May 9, 21 days later. The latest ever deficit-inclusive Tax Freedom Day occurred during World War II, on May 21, 1945. 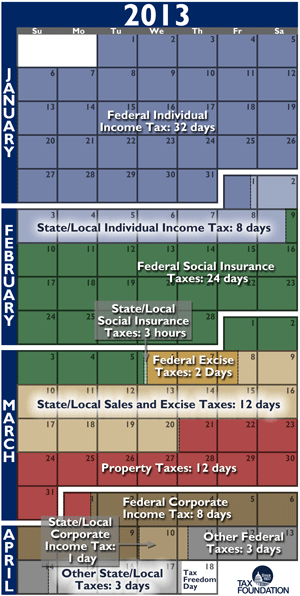 When is my state's Tax Freedom Day? The total tax burden borne by residents of different states varies considerably, due to differing state tax policies and because of the steep progressivity of the federal tax system. 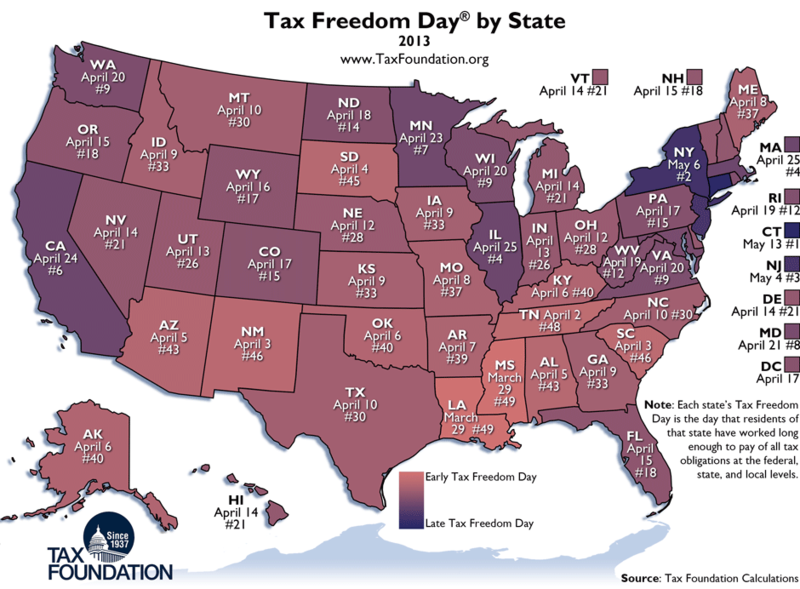 This means higher income states celebrate Tax Freedom Day later: Connecticut (May 13), New York (May 6), and New Jersey (May 4). Residents of Mississippi will bear the lowest average tax burden in 2013, with Tax Freedom Day arriving for them on March 29. Also early are Louisiana (March 29) and Tennessee (April 2). How has Tax Freedom Day changed over time? The latest ever Tax Freedom Day was May 1, 2000 – meaning Americans paid 33.0 percent of their total income in taxes. A century earlier, in 1900, Americans paid only 5.9 percent of their income in taxes, meaning Tax Freedom Day came on January 22.
Who calculates Tax Freedom Day? Tax Foundation economists calculate Tax Freedom Day using federal budget projections, data from the U.S. Census and the Bureau of Economic Analysis, and projections of state and local taxes. Tax Freedom Day was conceived in 1948 by Florida businessman Dallas Hostetler, who deeded the concept to the Tax Foundation when he retired in 1971. Tax Freedom Day by state has been calculated since 1990, when sufficient data became available. Learn more about Tax Freedom Day at www.TaxFoundation.org/taxfreedomday. Tax Freedom Day has not always been this late in the year. World War I tax increases led to a jump in Tax Freedom Day from 1917’s January 24 to 1918’s February 8 to 1921’s February 22. In the 1920s, when Justice Oliver Wendell Holmes described taxes as the price of civilized society, Tax Freedom Day was arriving in February. The Great Depression and the Hoover/Roosevelt tax increases led not only to a later Tax Freedom Day but a shift in who was collecting. In 1932, Americans spent 10 days paying federal taxes and 46 days paying state and local taxes. By 1940, Americans worked 33 days to pay each. World War II brought increased federal spending and borrowing, with Tax Freedom Day arriving in April for the first time in 1943. The federal tax burden never returned to pre-war levels. The 1950s and 1960s also saw a rise in state-local tax burdens and a boost in economic growth following the 1964 Kennedy/ Johnson tax cut. Vietnam War-era tax increases and the “stagflation” of the 1970s pushed personal incomes into higher tax brackets, and by 1981, Tax Freedom Day arrived on April 24. The Reagan tax cut signed into law that year ushered in an economic boom; federal revenues grew but the economy grew even faster. Despite pressure on state and local taxes following taxpayer revolts like Proposition 13 in California, the strong economic growth led to increased tax collections, and in 1989, Tax Freedom Day arrived on April 22. That year, federal income tax revenues as a share of the economy were higher than they had been in nearly all years prior, and higher than all but one year (1952) of the 1940s, 1950s, and early 1960s, when the top rate exceeded 90 percent. A string of record-setting federal tax burdens followed, and the latest ever Tax Freedom Day occurred on May 1, 2000. With federal revenue routinely exceeding forecasts, there was strong popular pressure for a major tax cut. The new president delivered on his tax cut promises, which, combined with a recession in 2001, caused the tax burden to fall considerably. In 2003, Tax Freedom Day arrived on April 14, more than two weeks earlier than it had in 2000. Beginning in 2007, stimulus tax cuts and a weakening economy pushed Tax Freedom Day earlier still; in 2009, Tax Freedom Day was on April 10, earlier than any year since Lyndon Johnson was in the White House. Federal tax increases and the economic recovery will push Tax Freedom Day this year to April 18, five days later than last year. We count in the denominator every dollar that is officially part of national income according to the Department of Commerce’s Bureau of Economic Analysis, and in the numerator every payment to the government that is officially considered a tax is counted. Taxes at all levels of government are included, whether levied by Uncle Sam or state and local governments. In calculating Tax Freedom Day for each state, we look at taxes borne by residents of that state, whether paid to the federal government, their own state or local government, or governments of other states. Where possible, we allocate tax burdens to the taxpayer’s state of residence. Leap days are excluded to allow comparison across years, and any fraction of a day is rounded up to the next calendar day. For a more detailed description of Tax Freedom Day’s methodology and some questions relating to the timing of tax burdens and income, please see Tax Freedom Day: How It’s Calculated and Addressing Some Methodological Issues. 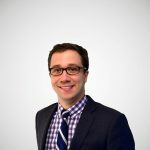 Kyle Pomerleau is Chief Economist and Vice President of Economic Analysis at the Tax Foundation. In his current position he leads the tax modeling team, oversees the center's research, and researches and writes on a variety of federal tax issues.